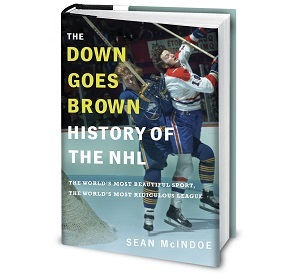 Down Goes Brown: What happens when one team has two elite defensemen? What happens when one team has two elite defensemen? The Erik Karlsson watch continues. After rumours swirled all weekend that a deal to send Karlsson to Tampa was imminent, we’ve made it into the week without a trade. The Lightning still seem like the frontrunner, but for now, nothing is official. That’s good news for everyone who isn’t a Lightning fan, because it means there’s still a chance that the two-time Norris winner won’t end up playing on the same team as this year’s recipient – Victor Hedman — and maybe even on the same pairing. That’s vaguely terrifying for the rest of the league, since we’re told that defence wins championships and the Lightning would have two of the very best in the league. That kind of star power sharing the same blue line is rare, but not unheard of. So today, let’s run through some of the times over the past 30 years or so that one team could run out a pair of Hall of Fame defencemen. Note that we’re talking about a pair here, not necessarily a pairing – in most cases, these players weren’t used on the same unit, and we don’t know whether Karlsson and Hedman would be. But even if they’re deployed separately, having two Norris-caliber defencemen gives a coach all sorts of opportunity to dominate matchups. It also virtually guarantees a Stanley Cup… most of the time. As we’ll see, there are no sure things in the NHL, although having an all-star blue line comes awfully close. There’s a good chance that when you saw the subject for this post, this is the first pair that came to mind. They land right in that sweet spot where they’re recent enough that everyone remembers them, but long enough ago that we can start to build a mythology around them. In the case of the Ducks, the mythology goes something like this: Anaheim was a good team coming out of the lockout, and they became a very good one when they signed Niedermayer as a free agent in 2005. But it was the acquisition of Pronger in 2006, thanks to some aggressive maneuvering by GM Brian Burke, that gave Anaheim one of the greatest pair of blueliners in modern NHL history, and they rolled to the Stanley Cup the very next year. Most of that mythology is pretty much true, although it leaves out a few details, like Pronger forcing his way out of Edmonton and Niedermayer choosing the Ducks at least partly because he could play with his brother. Those minor details aside, it’s hard to deny how overpowering the pair were. Randy Carlyle often used them on the same unit; other times he’d split them up and basically play the entire game with a Norris winner on the ice. During Anaheim’s Cup run, both players averaged roughly 30 minutes a game, miles ahead of any other Ducks. Buyer beware; Karlsson maybe damage goods. He never retained his former self after returning last year. It may have been the team, the BS with Hoffman's GF, or never got back in shape.